The Maren 72 O.E. can be used for a wide range of materials including corrugated paper, chipboard, tissue, non-wovens, and flexible packaging. For a complete material handling system, Maren 72 O.E. Series balers can be used in conjunction with our cart dumpers, piggyback conveyor/shredders, and automated bale retrieval system. We serve today’s recycling industry by designing, manufacturing, and delivering the world’s finest horizontal single & twin ram balers. Whether you are searching for high quality and dependable cardboard balers or paper balers, Excel Manufacturing is the cardboard and paper baling machine manufacturer for you! We start with high quality materials and bring you the best baler available anywhere! 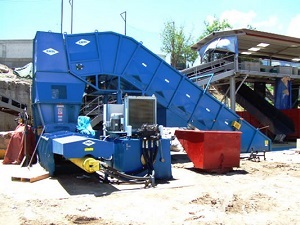 Balers come in a wide variety of configurations, sizes, and costs based on the materials being recycled and the output demands. 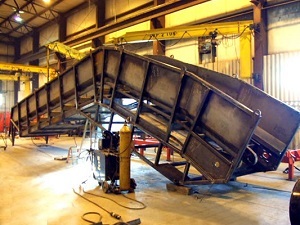 Our designs are for reliability and longevity, with operator safety in mind. We are an industry leader in custom applications, allowing us to design equipment to fit your cardboard-baler requirements. We engineer for maximum performance and ease of operation. OBC Industrial is a premier distributor of new and used industrial balers and compactors. Only quality, reliable baling and compacting systems. We can also provide turnkey installations and rigging services with new systems - all from recognized names at an affordable price. Visit our website or contact us today for more information! Compactors is a producer of balers and industrial balers, trash compactors and garbage compactors, and state-of-the-art recycling equipment. We adhere to quality, the best performance, and reliability. Compactors serves a wide range of diverse industries and markets, including hotels, schools, hospitals, apartments, and more. We'll lower your trash bill! Contact us today to learn more. Balers, or baler machines, are industrial equipment used to compress a wide variety of waste materials and byproducts into small, manageable bundles. These bundles, called bales, can then be more easily transported, disposed of, stored, handled or recycled. There are a number of different types of balers in categories both broad and specific. One kind of baler that has a very specific used is the cardboard baler. Cardboard balers compress and bind both cardboard and similar waste materials, such as paper and plastic. Usually, they do so for recycling purposes, whether that be in preparation for shipment, for temporary storage or for the general minimization of cardboard waste. Because cardboard, especially in the form of tubes and boxes, is such a commonly used material and because it tends to take up so much room, cardboard baling is quite popular in a number of industries, including manufacturing, retail and consumer goods and services. The choice of what kind of cardboard baler to purchase depends, in part, on an interested party’s particular needs and budget. Many baler manufacturers group their cardboard balers according to the bale size that they produce. For example, a 26 inch baler produces a 26 inch wide bale. The standard cardboard baler is called the “6030,” baler, which means that it measures 60 inches wide by 30 inches deep. If they wish, baler customers may reject these standards and instead request custom-designed cardboard balers that produce bales in lengths and widths specific to the requirements and/or allowances of their recycling, storage or transportation capabilities. Also, high waste-producing businesses, such as retailers or food processors, may be interested in installing complete turn-key recycling systems around one or more individual balers. This choice would give them a green operation from head to toe, thus helping them reduce their impact on the environment. In addition to reducing carbon emissions, reducing a business’ volume of waste will make the process of disposal quicker, easier and less expensive. For companies that can afford it, complete turn-key recycling systems are a win-win. Of course, not every business or company is willing or able to invest in a brand-new, specialized system. Fortunately, custom balers are not necessary for an application to work. Also, cardboard balers are extremely durable pieces of equipment, and they are widely available for second-hand purchase. Used balers, if properly refurbished, can work just as well as any new baler. They are available for purchase from both online retailers and more traditional manufacturers of new and used balers. Those who wish to purchase a used cardboard baler should make sure to have it suitably tested, to make sure that it is in full working condition and that the quality of workmanship and material with which it was originally made is up to par. Whatever their choice, cardboard baler customers will most likely end of up purchasing a vertical baler. Cardboard balers are available as both vertical and horizontal balers, but because vertical balers are more well-suited to lightweight waste compression, they are the more logical choice. Note that vertical balers are named as such because their input zone, or where the material is loaded, is located at the top end of the baler. After it enters the baler, it is fed down into the baler’s chamber, where one or more hydraulic arms pound and crush it into a compact bale. Horizontal balers, on the other hand, are loaded from the side and they process baling materials horizontally as well. While generally less popular for this application, horizontal balers do offer an ability to bear greater loads of weight. Also, because, unlike vertical balers, they are usually loaded and unloaded automatically, they are more efficient than their counterpart. So, they may be found in the place of vertical balers where the cardboard being baled is heavy-duty or very high in quantity. Both systems use the power of hydraulics to accomplish compaction, because hydraulic systems tend to be more efficient than others and because they need and produce less heat to function. In addition, both vertical and horizontal cardboard balers can be equipped with an automated system that binds the bales before they fully exit the machine. This features ensures that bales do not come loose or fall apart prematurely. Recycling balers are popular machines, and for good reason. The reduction and recycling of waste is a huge and important undertaking for which all modern businesses must do their part. Cardboard baling is a necessary process. It frees space; it creates a safer, more productive work environment; it is environmentally responsible and, if a manufacturer develops a comprehensive waste management system, it may even provide an additional source of revenue.